Box Mission Church was built in 1880 for use as an infant school. It was made of corrugated iron and was very hot during the summer and freezing cold in winter. From 1918 it was used by the Church for Sunday School and for weekly evensongs on Sunday evenings. There was no altar in the church and no celebration of Holy Communion. The music was played on an old harmonium. During the week it was used for social functions such as concerts, whist drives, parties, etc. At this time the church faced west. 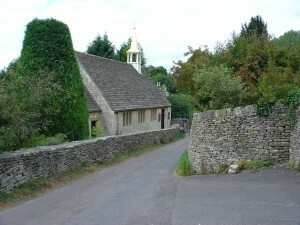 In 1928, The Reverend Rex Hodson became Rector of Minchinhampton and took a great interest in the Church life at Box. He started Holy Communion celebrations using his own portable altar which he had used when in the Navy. This aroused great interest in the community and donations were given in the way of a small altar, embroidered altar hangings, cross and candle sticks and a piano to replace the harmonium. 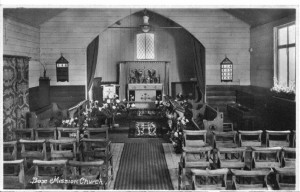 Financial donations enabled a small sanctuary to be built on to the existing Church in 1931 and it was then that the Church was turned to face east. The Church flourished with a Sunday School of 40, a children’s choir and packed congregations. In 1937, because of the deterioration of the roof, it was decided to save up funds for a permanent stone Church for Box. Fund raising events were started to raise the estimated £1000 – £2000 necessary. Then came the war and building plans were put to one side, but fund raising carried on and the Church life continued with many evacuees becoming involved. In 1945 meetings were held again and new plans prepared for a Cotswold Stone building, now estimated at £4000. In October 1951 The Rector, Canon Rex Hodson sat in Church for a Gift Day which resulted in enough money for building operations to begin. 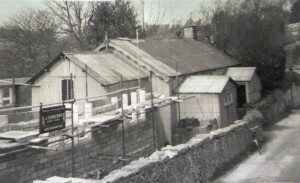 By 8th December 1951 sufficient building had been completed to enable the foundation stone to be laid and the then Bishop of Gloucester, The Rt Reverend Clifford Salisbury, came to lay it in gale force winds and lashing rain! By 24th October 1952 the Church was complete and ready for Dedication by Bishop Woodward. Canon Hodson, however, was not content with simply a Dedication, and the next Bishop of Gloucester, Bishop Askwith, agreed to a full Consecration which took place on 21st June 1958 with a full sung Mass. Box, in common with villages up and down the country, has seen many changes in the past 50 years. St Barnabas Church continues to hold a weekday Communion Service on Wednesday morning at 8.00 am and a Sunday service of Holy Communion with hymns at 9.00 am. We are indebted to all those who over the past years and in the present day have given and continue to give of their time, their talents and their financial support to ensure the Church building will remain solid for future generations and its worship to continue to the praise and glory of God. Taken from “A History of St Barnabas” by Alcie Daniels.